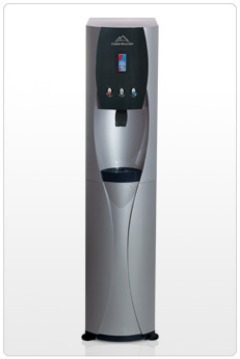 Fluid Treatment Systems introduces the Pinnacle, a dedicated Point-of-Use water cooler to meet the needs of our POU customers. The Pinnacle's state-of-the-art design offers three water temperatures, and LCD display that features icons for water selection, and a filter change indicator. Durably constructed for high capacity rental applications, it also features hygienic solutions such as concealed faucets, a sanitation fluid entry point and security against unauthorized entry of foreign particles. The Pinnacle also has numerous customer driven design features including; an optional UV light, filter storage compartment, and dual function drip tray. The Pinnacle is both functional and stylish and is definitely the POU water dispenser of the future.